They’re just like us. Except not. After a traumatic experience there as a child, Adelaide (Lupita Nyong’o) never thought she’d be back at the beachfront home that’s been in her family for years. But now, with a family of her own, she’s back at the beach and even more on-edge than ever. This time though, she’s doing her absolute best to ensure that her family has a good enough time to hopefully make new memories and get past the fact that she’s still suffering from a PTSD of some sort. However, just as the trip seems to be going perfectly fine, the power goes out, and another family of four, all clothed in red, show up at their front-door step and begin to terrorize them and their home. But why? And better yet, what the hell is the family to do? Well, it’s simple: Run away as fast as you can. This may be sacrilege to some, but personally, I prefer Us over Get Out a bit more because for one, it’s actually a horror movie through and through. Sure, at the beginning there’s a bunch of light, witty, and rather playful stuff going on with the characters and the plot, but really, that’s expected with most movies, let alone horror ones. 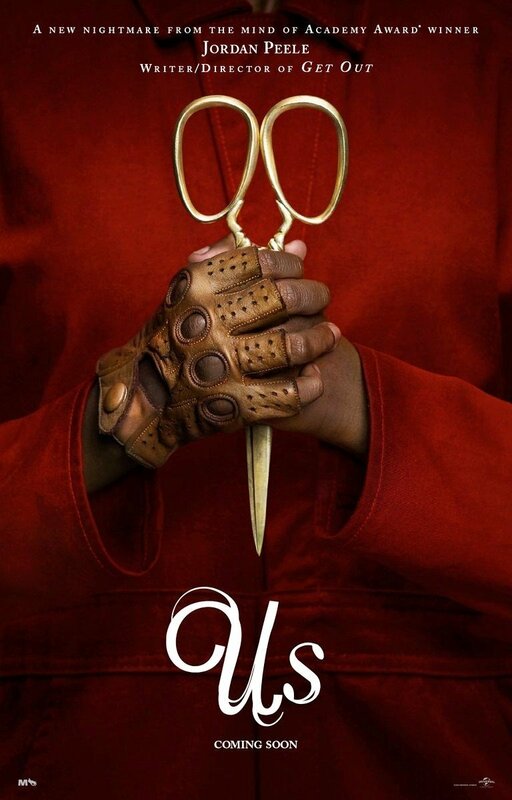 Jordan Peele knows that the best way to lull us into some sense of safety is to get us chuckling, get us happy, and get us involved with these characters, understand their relationships between one another, and mostly, give us the impression that not everything’s about to fall apart and go incredibly and completely insane. Because well, that’s precisely what happens. And it’s why Us, while still not a perfect movie, is a much more accomplished horror flick than Get Out, because it sets out to actually scare the hell out of its audience. There’s obviously still some satire amongst all the scares, but really, Peele tones all that down so that he can have us expecting the worst of what’s next to come at every turn and it works; Peele took risks already with Get Out, but this time around, he’s just messing with us. Half of the time Peele isn’t even playing by the conventional rules of the horror genre; there’s not many jump-scares, as much as much as there’s just a setting-up of certain shots that send chills down your bones. It’s almost akin to Kubrick, which I know is a very high bar to go for, but when watching Peele’s style, it’s hard not to see any differently. Just your friendly neighborhood scaries! Of course, there’s a lot to this plot that’s best not to give away too much of, but just know that a lot of Us centers around a few twists, turns, and overall mysteries that may or may not work for you, depending on how well you feel Peele has explained it to us, the audience. For me, it worked to a certain extent – some twists made perfect sense, whereas others were a bit of a head-scratcher. Still, there’s at least some thought being put behind the constant shrieks and scares, which is an unfortunately rare thing to get with the horror genre. But hey, we have it with Peele and it looks like he’s here to stay. Which is definitely a good sign for the rest of the world, even if it’s not necessarily a good sign for our own respective heart-rates. Consensus: Chilling, intense, and most importantly, thought-provoking, Us is a slight improvement from Get Out, as it goes full-horror, while also not forgetting to make us think of why everything and everyone is so damn scary to begin with. Wait, this is America, right? So where’s the guns?!? I too think it is an improvement over Get Out (significantly so). And seeing it again after knowing the end…it puts things in a much different perspective. y’all both think it’s better than Get Out? Bold claims… I thought Us was a solid horror film but unlike Get Out it has plot and logic holes that hurt its integrity if you think about it at all. I really did. For me “Get Out” had such big ideas that I liked but really sloppy execution specifically in the third act. For me it had some pretty massive plot holes that I just couldn’t get past. Regardless, both films provide room for some great conversations. I have yet to see Get Out. Would you recommend watching Get Out before Us? And here I thought I was the only one that enjoyed Us more than Get Out. Sure Us has a lot of plot holes but it was creepy-good and really made you think once it was all over. Solid review.